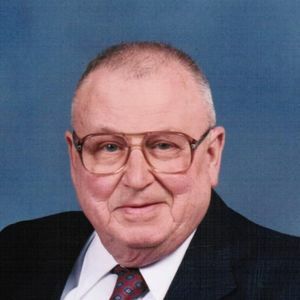 Carroll M. Seward, 92 of Lima, Ohio died on Tuesday, May 8, 2012, 11:14 A.M. at St. Rita's Medical Center, Lima, Ohio. Born Friday, June 27, 1919 in Bremen, Ohio, he was the son of the late Edward Seward and the late Hazel Meyers Seward. Surviving are: a son, Edward (Janet) Seward of Lima, OH; two daughters, Mary Lee Akins of Lima, Ohio and Ellen (Rick) Hire of Belle Center, OH; seven grand children Marc Baxter, Brad (Amie) Baxter, Andrew (Dana) Hire, Aaron Seward, Karis (Sean) Thines, Heidi (Rich) Titus, Collin Seward; five great grandchild, Joey Baxter, Lily Baxter, Zoey Baxter, Ethan Hire and Meredith Hire. He was preceded in death by a brother, Thomas Seward, and a sister, Margie Davis. Visitation will be on Friday, May 11, 2012 from 2:00 p.m. to 7:00 p.m. at Chamberlain-Huckeriede Funeral Home. Funeral Service will be on Saturday, May 12, 2012 at 10:00 a.m. at Chamberlain-Huckeriede Funeral Home with Rev. David Thompson officiating. Military graveside services will be conducted by the VFW Post 1275 at the Memorial Park Cemetery. The beautiful and interactive Eternal Tribute tells Carroll's life story the way it deserves to be told in words, pictures and video. To the Seward Family: Please accept my sincere condolescences on the loss of your dad. I remember him when I was just a little girl and we all played together on Dewey. May he now rest in peace and be in the glory of God and back with Ms. Reba and they are now dancing and laughing in Heaven. Peace and hamony to all. Love Joy and family.